The thing rested on the ridge of a knoll and when I stepped off the car it was perfectly in eye height some six or seven meters in front of me. I was so stunned trying to grasp the unbelievable, I was unable to speak. “And?” came an impatient voice from the driver’s seat. “Uh-huh” I managed, unable to comment the impossible sight in a more eloquent manner. As I faced a surface of smooth regmaglypts that was as large as a fry pan. 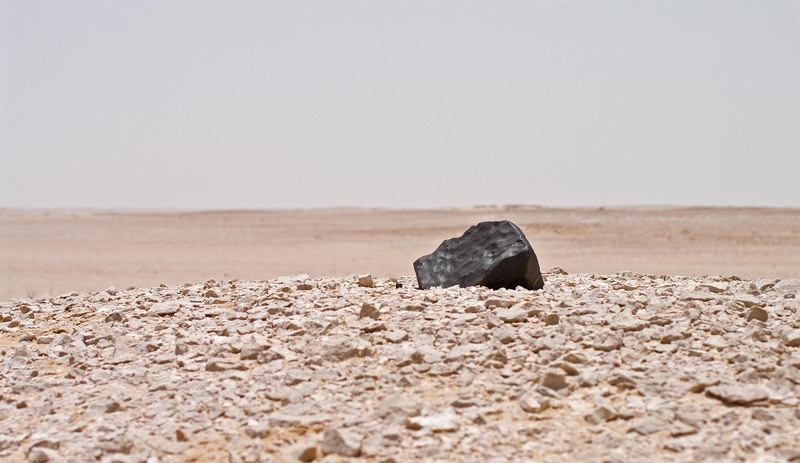 In front of me lay, no literally stood, a meteorite larger than anything we had ever hoped to find. On the crest of this hill on the snow white gravel it looked so enormous and utterly dark, like a black hole that sucked in the light from its surrounding. Thomas joined me. “No way …” he spoke under his breath, turning away from the sight and returning twice, touching his upper lip in staring disbelief. Chuckling I dropped to my knees in front of the rock. It was indeed enormous. Like a sculpted anvil its edges were gently shining with a mat patina. Forty-eight large broad and elongated thumbprints were evenly distributed among the elegantly curved surface like alien petroglyphs. Fusion structures could be seen escaping from their centres towards the edges. Resembling the traces of an acetylene torch they were shaped upon entry of our planet’s atmosphere by the incredible forces of the plasma jet stream in the bolide’s front wave. Slowly I walked around the meteorite. The opposite side looked different, more chaotic, and dramatic. Heavily sculpted surfaces with ablated protrusions, channel like grooves and a cluster of deep elongated regmaglypts bore witness to a fiery passage onto our world. 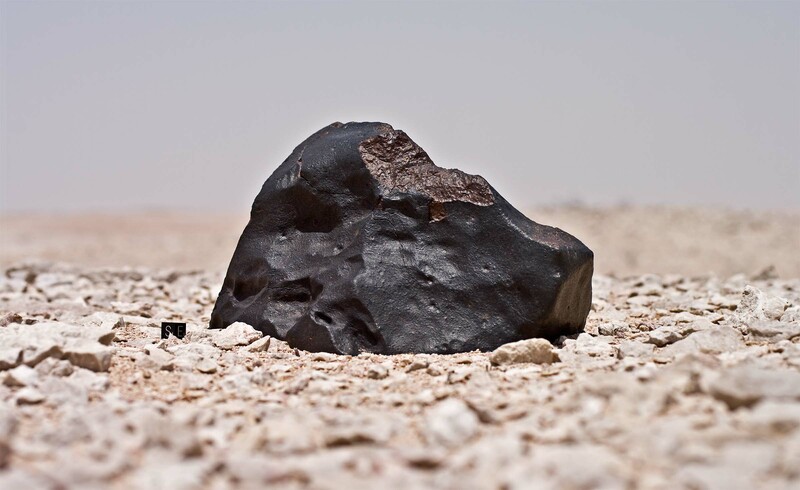 A meteorite stone with its molding frozen in time. I had visited quite a few meteorite collections, but not many stone meteorites I had seen could cope in size and character with the meteoritic rock we had just discovered. I merely noticed the others arriving. Our small outfit was kneeling and standing around the massive body of the meteorite like ancient pilgrims around a worshipped altar. Usually a meteorite find was accompanied by excited cheering, snapping of camera shutters and busy talking. Not this time. For a while there was only awestruck silence. Pjotr shook his head in disbelief while Ivan, eyes wide open, forgot to put his dropped jaw back in standard position. “How much will it weigh?” Pjotr finally wanted to know. “I have no idea brother. Eighteen at least, twenty perhaps, maybe thirty kilos” I guessed. We’ll have to see how much of it is below the surface. I shot a couple of photos, but none did the find any justice. Thomas painstakingly recorded the documentation on video. It took us more than an hour to document the find, record coordinates, to take soil samples and search the closer surrounding for eventual fragments. Pjotr handed me two more chips of 30 and 10 g respectively, which he had found several meters away down the slope. a meteorite fell next to me. but I could not budge it. mighty men clustered about it. Sand trickled from the regmaglypts as it came off the ground and as I balanced it on the cardboard cushion Thomas had prepared. About ten centimetres of its lower portion had been embedded, fortunately with no obvious signs of chemical weathering. It was not possible to determine an approximate terrestrial residence time of the meteorite without measurement of cosmic radionuclides, but obviously it had withstood the ravages of time outstandingly. Now that the rock was fully exposed we could admire its entire build. It was anvil shaped and one large corner had sheared off along a pre existing shock plane as if cut with a knife. Closer inspection revealed that this surface too was coated with thin fusion crust, thus this final break up had still occurred during the hot flight. The fusion rind of the embedded portion was pristine with even the delicate webbing of contraction cracks still in place. Not even the slightest scratch was visible. Thus it could never have been the impacting face of such a mass. On contrast, on the other, exposed side it showed obvious damages where several notches were broken from an edge and chips of fusion crust were missing. This was a more likely candidate for an impacting face. In theory, it was possible that the meteorite had impacted at or near the spot where Pjotr had found the smaller fragments, and ricocheted to where we had found it. However this seemed unlikely as the particularly soft soil at the find location, which was only covered with a thin layer of desert pavement, would rather have swallowed the impacting mass then repelling it. Even so, if that was how it happened, it was still highly unlikely that the meteorite had jumped exactly to the crest of the knoll where we had found it. Another explanation seemed more plausible. The meteorite could be seen from a great distance. We had used it as a reference point. If this place ever had any frequent traffic in the past one could presume that our predecessors had referred to the rock in the same manner. I was convinced that the stone had been taken from nearby where it had fallen and been placed on the crest by purpose. 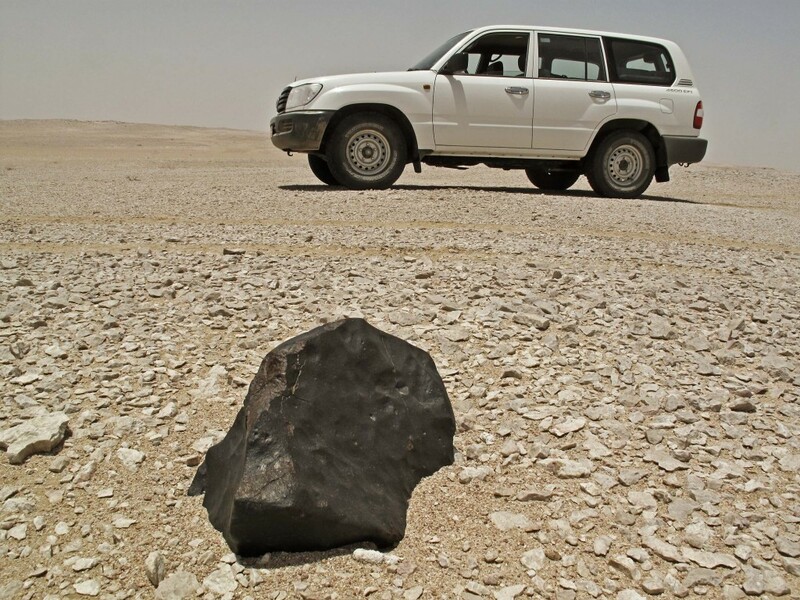 Meteorites used as landmarks have been reported previously from the Western Sahara. Commonly the nomads and desert dwellers pile up stone pyramids on prominent spots which are called “Alamat” in Arab. Most of them date back to the heydays of caravan trade, many of them back to the late Neolithic. 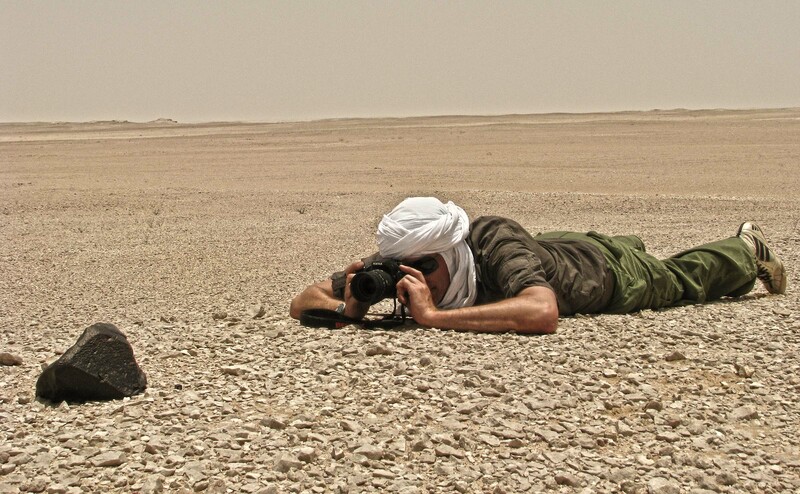 During my travels in the Ténéré desert I had seen the sharp eyes of a Tuareg spotting a small Alamat over a mere unbelievable distance of three miles. This one was better than any stone pyramid. It had the perfect colour for maximum background contrast. It was the landmark par excellence. Although we knew what to look for, as I had seen the telltale signs of ancient caravan routes many times before, we found no traces, neither of ancient nor of contemporary trails. But we knew of an old artesian source about twenty kilometres to the northwest which may have been a potential station of a long distance caravan route. The whole matter left many questions unanswered and I planned to do some further research back home. And indeed the study of 15m Landsat images provided additional evidence. An old trail cut our find position in almost east-westerly direction. This was definitely not bundles of recent tire tracks, but obviously a considerably older track. The dirt tracks in the area which were related to motorized transport sometimes disappeared in the recent wadis, but they were clearly visible both on the deflation and on other sedimentation surfaces. The track we had found on the satellite images was invisible on the sedimentation surfaces and also on the more exposed deflation surfaces. Contrary to the ruler straight car tracks our trail made slight bends as it followed striking landmarks.